Curly Leaf Parsley | Healthy, Tasty and Most Certainly a Super Herb! Curly Leaf Parsley - Very Healthy, Tasty and Most Definitely a Super Herb! There are two main varieties; curly leaf parsley and flat-leaved. As the names suggest, flat or Italian parsley is known for its flat, broad leaves and curled (petroselinum crispum) has, obviously, curly leaves. The two are virtually identical as far as nutrition and gardening requirements, and they can both be used in recipes calling for the herb. 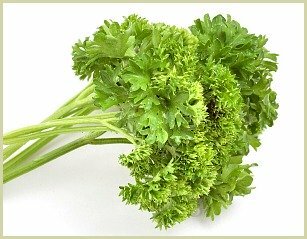 Overall, many people assume that flat leaf parsley is better for cooking, while curly is better as a garnish because it looks more decorative. There are chefs who will argue passionately for the merits of flat over the other, or vice versa! 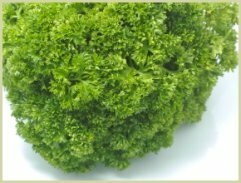 Over the centuries, people have said that curly parsley has no flavour or a bitter flavour, or that flat parsley is too strong and will overpower a dish. All of these things really depend on the individual plant, and none are true overall. Click here for further info on the plant. It's used in many European, Middle Eastern and North American dishes, and really, you can use it in any recipe. Its subtle flavour and aroma are perfect for a nice tabbouleh, a rich boeuf bourguignon or accenting a tasty risotto. It's a key herb in the French bouquet garni and in a persillade, which is a chopped mix of garlic and fresh parsley. It is also key to many Italian soups and sauces, and is necessary for the zesty gremolata (a mix of parsley, garlic and lemon zest) which accompanies an excellent osso bucco alla Milanese (Italian veal stew). Middle Eastern cuisine also relies heavily on the chopped leaves, using it in tabbouleh, stuffed grape leaves and with many lamb dishes. For a real surprise, try coating some freshly washed curly leaves in a nice light batter and deep-frying it for a tasty and fresh snack. Fresh or dried can be used to make a healthy drink. Click here for my recipe. Generally speaking, flat leaf has a stronger flavour when it is a younger herb, while curled leaf matures into its stronger taste. You can readily substitute one variety with the other in any recipe and you will not notice a profound difference. One major difference is when washing the leaves. The curly variety can really hold onto dirt when its leaves are fresh and tight, so wash carefully. As well, these leaves can give the raw herb a coarse texture, which is why there are some people who prefer to use the flat version as a raw garnish. Read more about curled parsley.